John Barrowman and his sister Carole are delving into a Dark Archer story for DC Comics. This morning, TV Insider had the first details about Arrow: The Dark Archer, a new digital comic series premiering next week, January 13, on many apps. The series will span for 12 chapters and it takes place between Arrow Seasons 3 and 4. 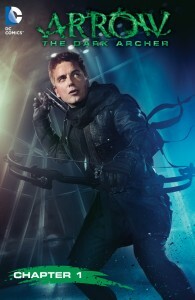 The series is written by John Barrowman, “Malcolm Merlyn” himself, and his sister, Carole, both of whom are DC Comics fans for a long time. Appropriately, the story will be telling a story about Malcolm. You can read TV Insider’s piece on Arrow: The Dark Archer here — their article includes a fun interview with John & Carole Barrowman — and here is one place where you can pre-order your copy!